Many of the team behind the Great History Tapestry are now developing plans for a Tapestry that looks across the whole of European History. It will seek to engage as embroiderers many of the exPats living in Scotland as well as stitchers in the countries themselves. Core to the team are Andrew Crummy as designer and Gillian Hart as Co-ordinator and no mean embroiderer herself. She worked in key roles with Andrew Crummy for all three of the major new Scottish tapestries since 2010: The Prestonpans, The Great History of Scotland and The Scottish Diaspora. 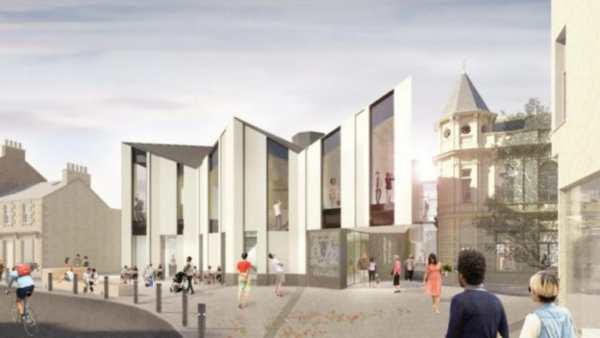 This All Europe News comes as construction readies in Galashiels for the first of at least two 'permanent exhibition homes' that will be needed for them. In Galashiels a Pound Shop demolition has cleared the way for a permanent home for the Great Tapestry of Scotland in The Borders. The old Poundstretcher store in Galashiels will be replaced by the visitor centre in a £6.7m project. Scottish Borders Council said it was a "very significant milestone" in its scheme to boost regeneration of the area. Once the Visitor Centre is constructed on the site it is hoped it will attract more than 50,000 people to the town every year and create 16 jobs. The nearby former Post Office [right] will also be incorporated into the plans. Extra annual spending by visitors of £900,000 has been forecast within the local economy, supporting another 17 posts. Earlier this year, the project secured £1.18m from the Scottish Government's Regeneration Capital Grant Fund. As well as the Visitor Centre, Scottish Borders Council hopes to see wider improvements and councillors are being asked to back five streetscape projects. ◾the creation of the Coulter Candy Trail - dedicated to the Galashiels weaver Robert Coltart who wrote the folk song Ally Bally Bee. Scottish Borders Council's executive member for Business and Economic Development Mark Rowley said it was a "hugely exciting time" for the town and the region. The project could help "reshape the town" and encourage investment. The Great Tapestry of Scotland centre is expected to open in spring 2020, and will be managed by Live Borders, the region's Culture and Sports Trust. "The Great Tapestry of Scotland is a national treasure that tells Scotland's story in vivid colours and images," commented Alistair Moffat of the tapestry's trustees. "It will shine like a jewel not only at the heart of Galashiels' regeneration but also attract thousands to come to the Borders or stop to discover more about our history on their way north." Prestonpans' own plans are in a state of aestivation! In The Pans we've already explored several possible locations with care since 2010, most recently the BathHouse at Prestongrange Museum which had ELC support. But the Heritage Lottery Fund asked us to think harder and longer about the 'optimal location and the dynamics' of the Living History Centre we envisage. And that's precisely what we are currently doing - with their support. All past endeavours, present plans and future ambitions are being audited and an international comparative study is being undertaken on how best to achieve a self sustaining facility for the long term. The tapestries' condition and mounting have been expertly monitored and requirements for conservation identified. A short list of three locations is being evaluated with promised ELC support as the Scottish Borders Council has given for the Galashiels initiatives. By Summer 2019 we expect to create a Nationally Agreed Manifesto of what needs be achieved. It will almost certainly have a broader scope than in Galashiels, stretching beyond fine exhibiting our two tapestries. It will deliberately place the Battle of Prestonpans in the context of the Jacobites from 1686 to 1807. It will explore the sociological and enduring artistic significance of the community art manifest in the tapestries. And it will enhance the already understood literary inheritance of the Prince's Victory in 1745. Importantly, and in common with Galashiels, what we do will be deeply linked to the regeneration of Prestonpans in its post-industrial era. Our Economic Feasibility studies all show that our close proximity to Edinburgh affords great opportunities for substantial visitor numbers.